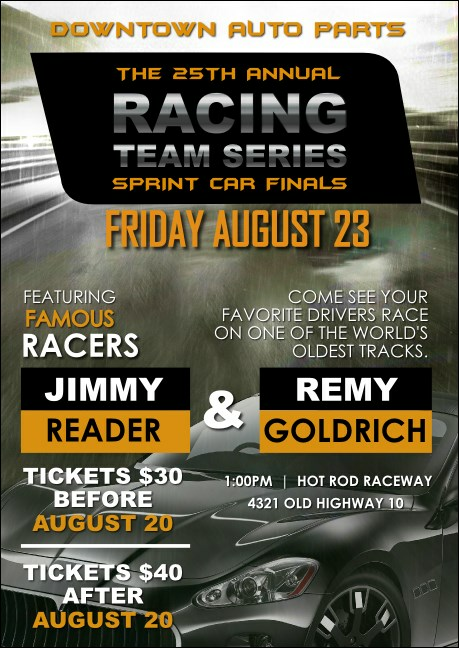 Accelerate ticket sales when you incorporate a stack of Auto Racing Club Flyers into your pre-event publicity! Ideal for promoting car shows, themed fundraisers and motorsports competitions, this template offers twenty-five text lines with which to convey your event’s details over top the image of a drifting sports car. Pack even more punch into marketing efforts when you include posters, invitations and postcards from its matching event kit. Stay ahead of the curve with TicketPrinting.com!